Construction will start early next year on a £400 million 34 storey office development nicknamed ‘Gotham City’ that has been granted planning approval by the City of London. The 910,000 sq ft development - mainly offices but also including 20,000 sq ft of shops and restaurants – will create 390 construction jobs during a four year period, according to developers Henderson Global Investors. Demolition will get under way soon on the site known as the Leadenhall Triangle at 40 Leadenhall, with a Grade 11 listed 1865 building on the site at 19-21 Billiter Street to be restored and integrated into the new scheme. 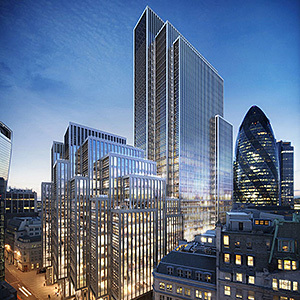 The site is in what is recognised as the City’s insurance district, close to the ‘Gherkin’, and the new 170 metre tall tower will join a group of multi storey buildings being called the Eastern Cluster. Architect Make says the building will become an iconic landmark. The design is a series of vertical ‘slabs’, cascading at successively reducing heights down to seven storeys as it slopes towards the Thames to preserve sight lines to St Paul’s Cathedral. It is also terraced at high level on the northern side of Leadenhall Street so it remains out of sight when travelling east along the Fleet Street ceremonial route to St Paul’s. The development which is designed to achieve a BREEAM ‘Excellent’ rating includes two basement levels, a roof level plant building, restaurant and shops at ground floor level and a roof terrace overlooking Fenchurch Street. The project team includes cost consultants EC Harris, WSP as structural engineer, Waterman as environmental consultants and DB9 planning consultant.